Michele Alfano of Michele Alfano Designs, known for her modern signature, recently took on a new challenge to work with clients who prefer a more traditional style. 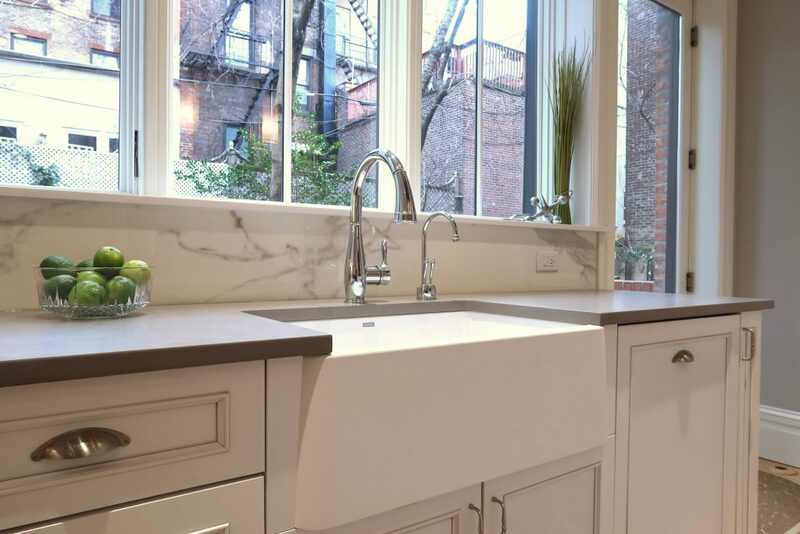 She was asked to modernize the kitchen of a 1892 brownstone in Hoboken, NJ yet maintain the home’s historic touches. Top Knobs Somerset transitional style decorative hardware was an integral part of the design. “The Hoboken home had great bones,” said Alfano. The designer introduced tin metal into the kitchen that brought in sophisticated and historic detailing. It not only honored the personality of Victorian homes in the 1890s, but also created an architectural focal point in this kitchen. 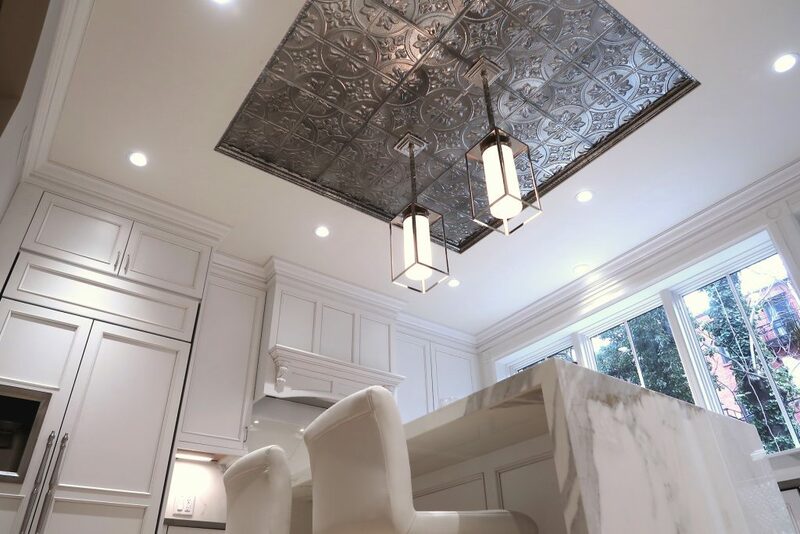 The tin was recessed into the sheetrock ceiling directly over the island and in line with the pantry. A pure modern gesture. 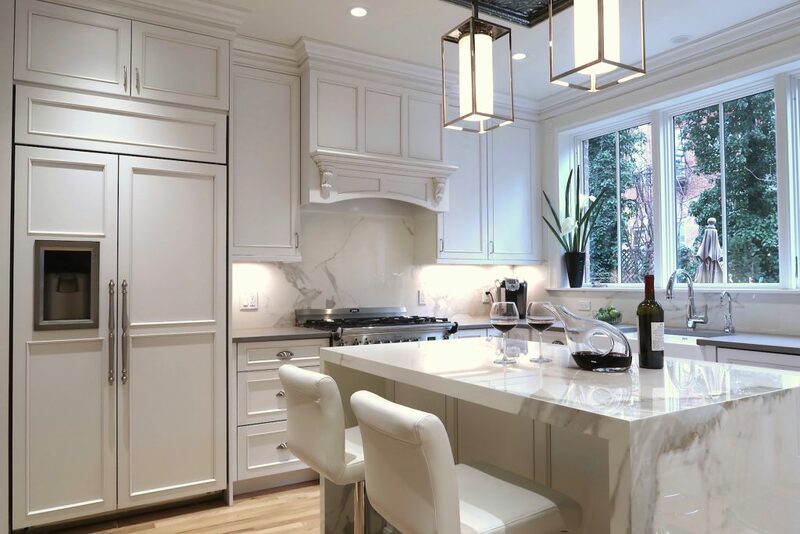 White cabinetry was accented with shades of grays. The honed gray concrete counter in combination with the polished marble-look island makes a statement. The crisp lines of the island’s waterfall stone edge swirl with attention. The client fell in love with the Top Knobs Somerset pull and cup pull decorative hardware collection in a brushed nickel finish. Its contemporary design with striking curves and straight edges was a nice accent to the lines of the cabinetry. The Somerset collection offers a seamless transition between classic and contemporary. The cabinet hardware is available in 2 ½” and 3” cup pulls, nine knob styles and five style pulls: Star pulls, Voss pulls, Arendal pulls, Somerset pulls and Wire pulls. A mixture of 18 finishes varying by product style make the transitional Top Knobs collection ideal for nearly any kitchen design. The apron front sink was a perfect selection for the kitchen. A contemporary take on a classic style, it is crafted in Silgranit, a granite composite that is ultra-cleanable and extremely durable. The client loves it. Layers of lighting fill the kitchen space. 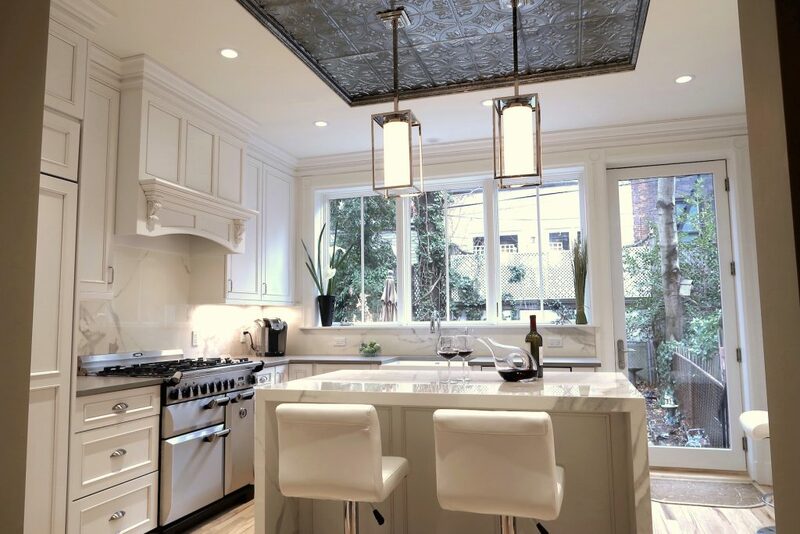 Recessed ceiling lighting, under-cabinet lighting and modern pendants drop from the geometric tin ceiling over the island. Opening up the back wall with a large span of windows was key to the design. Views of their garden with tons of natural light pours into their space making it feel larger. According to Alfano, the collaboration with the client worked seamlessly and they are so happy in their new home. The original version of this article cited the home as being built in the 1920s. The article has been updated to reflect the 1892 built date. 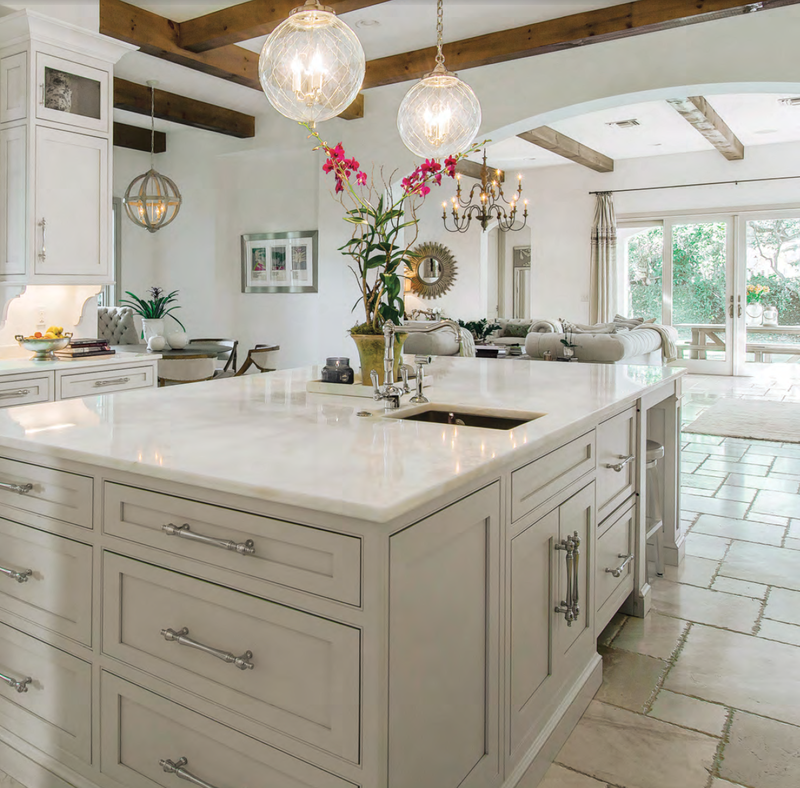 In Tampa, Florida a French inspired kitchen using Top Knobs cabinet hardware has won the prestigious Southeast Builders Conference 2015 Aurora Award for Interior Merchandising/Design in the Kitchen category for projects in the $1,000,001-$2,000,000 range. 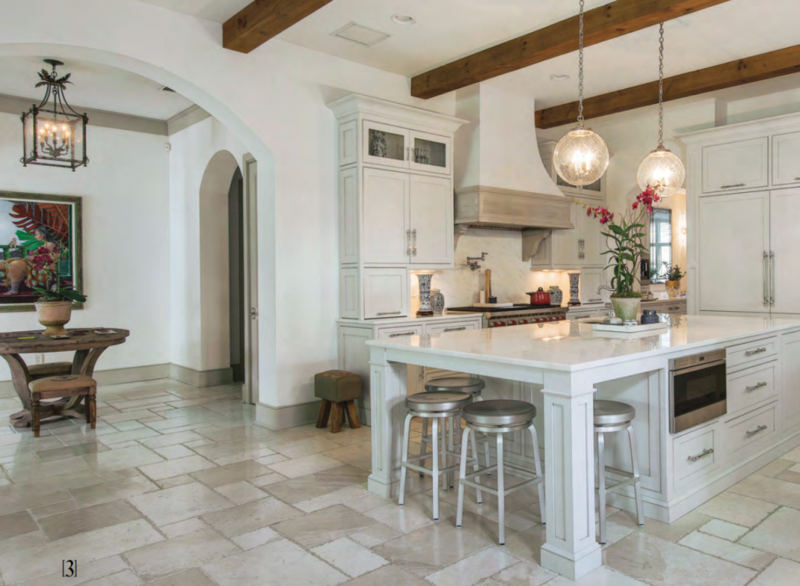 Here’s a look at the project which was recently featured in House Trends Tampa Magazine. Amoroso Cabinets, in calibration with Windstar Homes, were the masterminds behind the kitchen project. Since the kitchen is the heart of the home, the homebuilder put most of the budget into the kitchen where family and friends could gather in an open air space. Doug Amoroso, President of Amoroso Cabinets told House Trends Tampa that the reasoning behind the bright, open air kitchen comes from the latest trend of people using shades of taupe, mushroom and grey with simple details to result in a clean and contemporary feel. All of the custom made cabinets were perfectly accented by pulls from the Top Knobs Somerset Finial collection in the Pewter Antique finish. Photos by Johan Roetz, story adapted from Setting The Standard – Award Winning Design Brings Home The Prize for This Tampa Kitchen by Amy Diehl in House Trends Tampa. 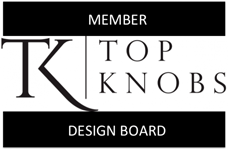 For more information about the complete line of Top Knobs decorative hardware products, visit www.topknobs.com and follow us on Facebook, Twitter, Pinterest and Google+. 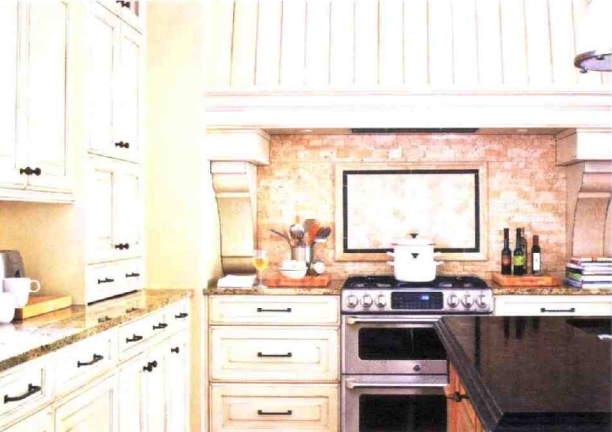 Top Knobs has helped transform another beautiful kitchen, as seen in Signature Kitchens & Baths Magazine. Designer Jill Brecheisin of Kitchens By Design was hired by the owners of a lakeside cottage in Michigan to transform their L-shaped kitchen into a beautiful entertainment destination for their friends, children and neighbors. While the original 31’ by 14’ was spacious, it lacked style and didn’t utilize all of the floor space to it’s maximum potential. Using a custom planked decorative range hood as the focal point for the kitchen, the designer also included two island counters, one for food prep and one for dining. The antique white cabinetry was perfectly accented by Top Knobs cabinet hardware in Patina Rouge. The remodeled kitchen includes knobs and pulls from the Normandy collection, as well as Somerset Finial from the Appliance Pull collection. For more Top Knobs news and projects, visit follow us on Facebook, Twitter, Pinterest and Google+.